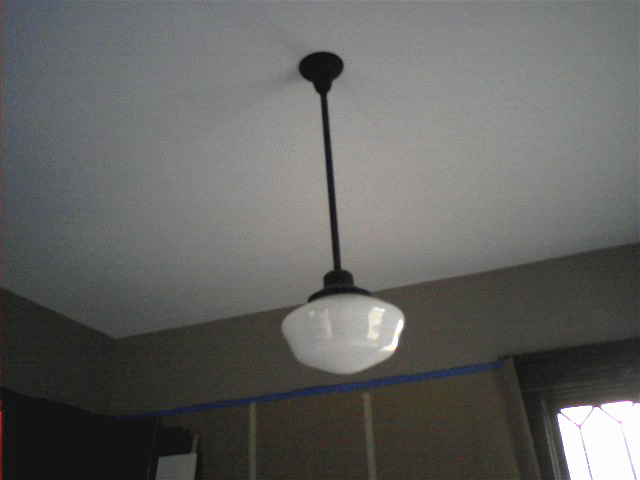 Trimwork in progress. 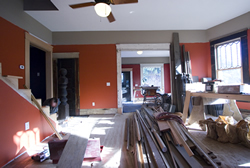 Floor protection was laid down and the interior of the house became a custom trim shop. 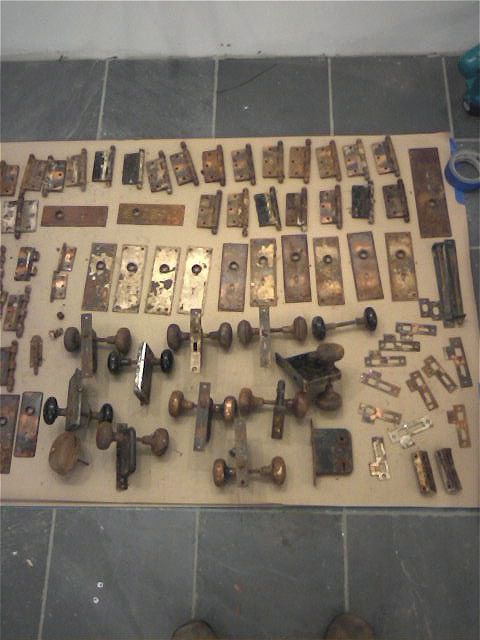 Each bundle was opened and examined for missing parts. Pieces were mixed and matched as needed, or created from scratch if need be. 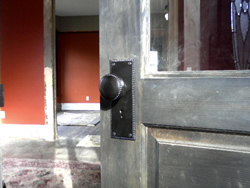 Doors were a mixture of original, salvaged, and new to create a uniform look throughout the house. Here a new five-panel door has been stained to appear old. 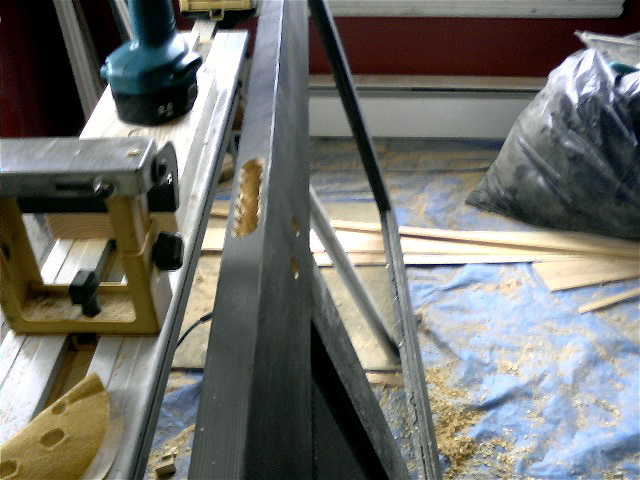 Then the top three panels have been cut out to receive a glass panel. 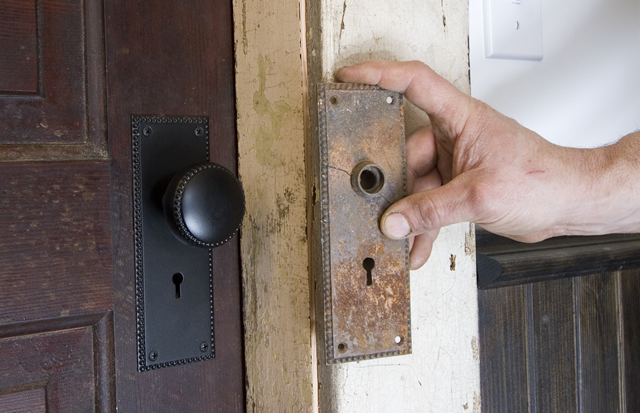 The edge is now being bored to accept an antique mortise lockset. A combination of approaches to create a unified look. The closet door to the right was purchased as a salvage item from the RE Store. 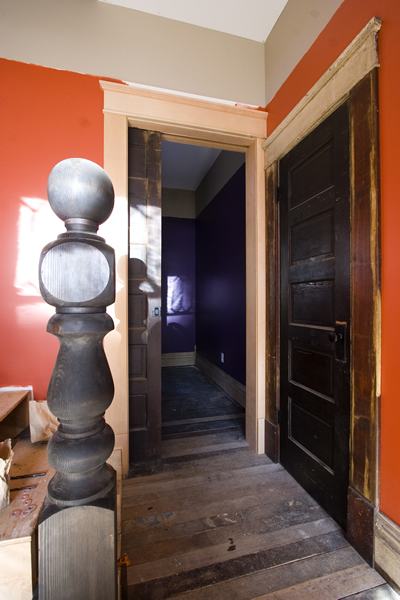 The library door on the left is one of house’s original extra tall double doors reused here as a pocket door. The trim is a combination of reused old, and custom milled new pieces. 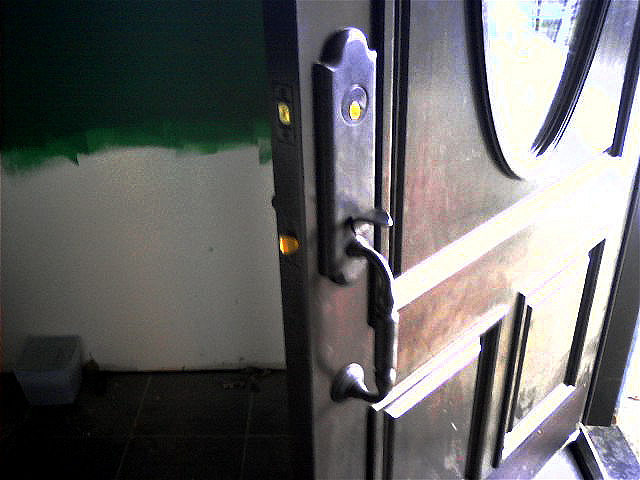 The front door is brand new, but was chosen perfectly to fit in with the era of the house. 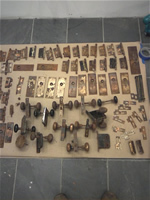 The antique hardware had been removed from all the old doors, but unfortunately was then left in an open plastic tub and got dripped on under some tarps. The hardware sat for almost a year in a pool of water. It was then cleaned up, sorted through, and sent to a powdercoater to be sandblasted and given a new finish. End result – yes, the one on the left used to look just like the one on the right. 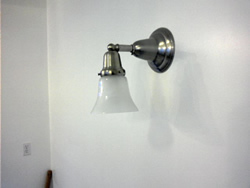 Reproduction antique lighting was installed throughout the house. Allocating a healthy portion of the budget to these very visible and eye catching elements of the project can be very helpful in giving a restoration job an historic look.